August 14th, 2018 by Terri Brisbin & filed under Uncategorized | Comments Off on The Final STORM is here! 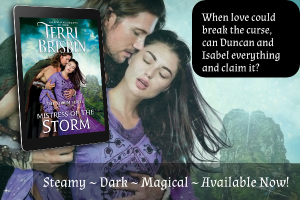 It’s a dark and steamy historical romance with glimmers of magic. Curses. Gifts. Love?